Location: End of Station Road at the rear of UK Fixings (Southern) Ltd. Present state: Sections of both platforms survive on a heavily overgrown wooded strip of land at the rear of UK Fixings (Southern) Ltd. The site is not within the boundary of UK Fixings and has public access. 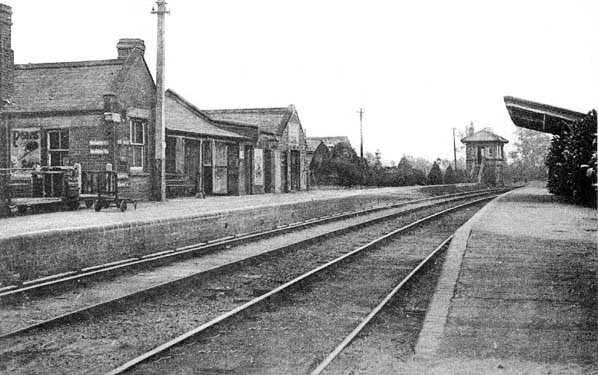 Notes: Sutton was the first train staff and ticket station after Ely and was the only intermediate station on the line with a crossing loop and two platforms. Buildings on the 'down' platform include the stationmaster's house, booking office, parcels office, waiting room and staff room. The up platform only had a waiting shelter. The signal box was sited south east of the down platform. South east of the signal box a junction led north into the site of the 1st station which became the goods station when the line was extended to St. Ives in 1878. The goods yard comprised two loop sidings one of them terminating at the old station platform. The sidings also served cattle pens and a coal yard with an additional siding to the Drake Forge Works to the east of the goods station. Class J17 0-6-0 No.65583 has just had her fire stoked as she sits in Sutton's second station. Then a March locomotive, she was transferred to Norwich in September 1961 and this view is believed to have been taken shortly before. 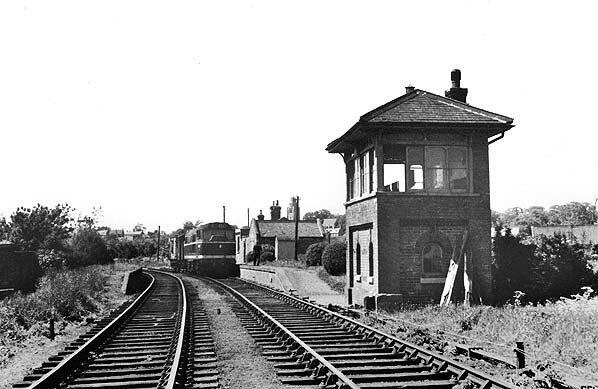 All signal boxes between Sutton Branch Junction (Ely) inclusive and Needingworth Junction (St Ives) exclusive had been abolished in 1932 with the exception of Sutton which remained open until closure of the line in 1964. Full signalling was also retained at Sutton. The reason was the complex shunting movements involved. 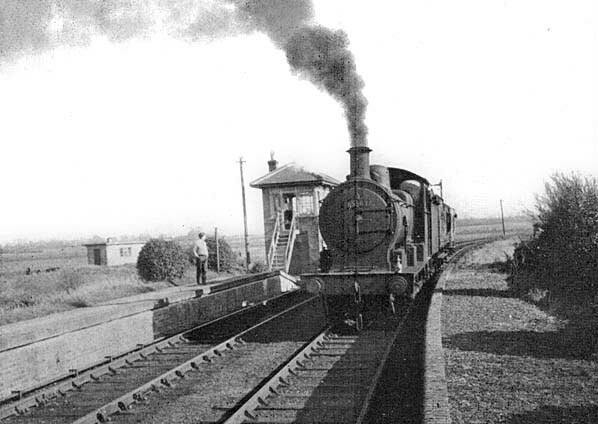 Sutton's second station served only as a run-round and shunting facility as wagons needed to be separated from those for or from Haddenham, Wilburton and Stretham and drawn out and pushed along the spur to the original station at which the goods facilities were located. The original station is out of view to the left. The Sutton goods ran daily, Monday - Friday, but at certain times of the year a second train would run if required but this high intensity(!) service had been discontinued by the time of this photograph. 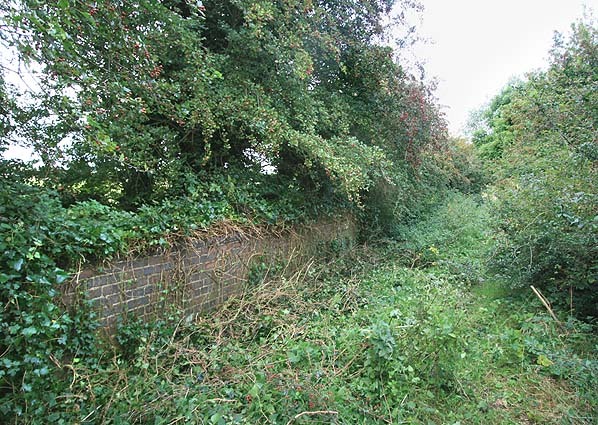 After the Sutton - Bluntisham section closed in 1958 part of the track towards Earith Bridge was left in situ and used for wagon storage. This brought additional movements to Sutton, most notably during the sugar beet season. All this warranted the retention of Sutton signal box and signalling, the box being manned on a part time basis to suit requirements. Note the survival of the station nameboard. This occurred at all stations on the line due to the running of occasional excursion trains until 1958. The station building, only partially visible here, dated from 1922. The original buildings were destroyed by fire in September 1921. The rebuilt station was again to suffer fire damage during the mid 1960s. The full name of Sutton, incidentally, is Sutton-in-the-Isle; a reference to its location on the Isle of Ely. 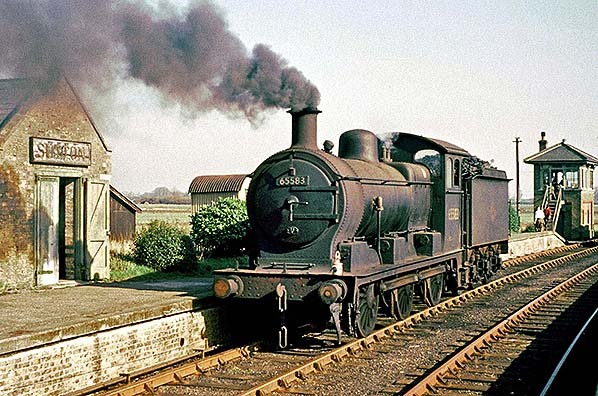 Locomotive No.65583 was one of the later class members not rebuilt from a J16 and she survived until February 1962 after a career lasting a little over 51 years.